The Troubled Asset Relief Program (TARP) was enacted by Congress and signed into law by the president of the U.S. in October 2008. The Obama administration had asked the American people to commit a staggering $700 billion of taxpayer money to bailout Wall Street. In order to insure appropriate oversight the president appointed and the senate confirmed a Special Inspector General (SIG) shortly after the establishment of the TARP. Neil Barofsky, head of SIGTARP, endowed with special powers is not required to report and to be supervised by the secretary of the Treasury. Moreover only the president can remove the SIG, which would be somewhat embarrassing since he appointed him in the first place. The Inspector General’s special rights make sure that he remains independent in his oversight from the secretary of the Treasury, who is ultimately responsible for the TARP. It was therefore surprising to learn that the Treasury department refused to provide Barofsky with documents about a financial institution receiving tens of billions in bailout dollars. Barofsky received support from lawmakers on that issue who are sympathetic to SIGTARP’s work and also complained about the lack of transparency in major recipients of TARP funds. In its most recent audit SIG surveyed 360 banks participating in the TARP and found that they misused the funds. 110 banks had invested some of the funds, 52 banks had used the money to repay existing debt and 15 used it to buy other banks. About 83percent used at least some funds to support new lending. SIG goes on to encourage the Treasury to require regular, more detailed information about the use of TARP money by participating banks. This would help to achieve the goal of transparency and satisfy the taxpayer. Treasury responded by saying it is impossible to track the money because it’s fungible, much like water running through fingers: "…paying an expense from one source frees up cash to be used for other purposes”. Barofsky did not buy it and argued Treasury was ignoring the common sense view. His latest audit found that banks could give at least a general indication of how they were using the money. It is not feasible why financial institutions using billions of dollars of taxpayer money to fund their operations are not required by the Treasury to maintain at least a documentation of the original disbursement of these funds. Treasury even admits that most banks don’t manage their TARP money separately from other funds. A paper trail would help to hold banks accountable but the Treasury seems to think that it is best not to interfere with the financial industry’s business at all in order to achieve results. Why government officials would think that, is not clear under circumstances that rendered proponents of financial deregulation to be dead wrong. This epochal mistake grudgingly coerced taxpayers to fund bailouts in the form of TARP in the first place. Back in March a Government Accountability Office (GAO) review found that regulators blatantly failed to do their job by ignoring the risks that had piled up in the financial industry. According to GAO, regulators like the Federal Reserve and the SEC relied too much on promises given to them by Wall Street’s representatives. They assumed according to SEC chairwoman Schapiro the industry would not take foolish risks and jeopardize their business model. Given the current dispute is it possible that we are going to make the same mistake again? Treasury has only one problem with their laissez-faire approach, it is not showing results. Even after injecting massive amounts of liquidity lending to businesses and consumers has not resumed to pre-crisis levels. Some see this as a necessary adjustment, but others are calling for more forceful actions from the government. Under pressure to revive lending the U.S. Treasury began to demand monthly reports on lending activities from banks participating in TARP. It took them until January to implement most basic reporting, when this should have been mandated immediately with the commencement of the funds. I strongly feel this shortcoming is indicative of a culture that has pervaded Washington to dismiss common sense when it comes to Wall Street. The perpetual lobbying of Wall Street’s executives in Washington is certainly not helpful in this regard (see WW Part I). 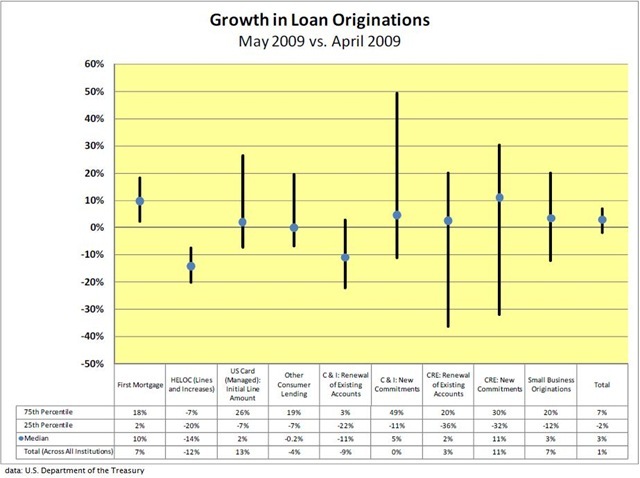 Results from Treasury’s latest monthly bank lending survey showed that total outstanding consumer loans, including first lien mortgages, home equity lines of credit, credit card loans, and other consumer loans, were flat in May, 2009. 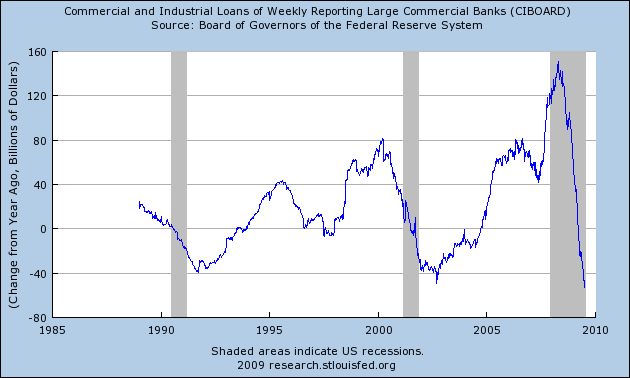 Commercial and Industrial loans (C&I) were also flat with demand well below normal. Commercial real estate loans (CRE) even fell with demand again lower than normal in May, 2009. Small business lending showed some growth but outstanding loan balance grew only by a meager one percent. These results were based only on data from the top 21 recipients of TARP funds. SIGTARP’s audit on the other hand was based on results from 360 participating institutions. There is really no feasible reason why oversight should be limited to 21 when according to the Treasury 651 banks have received government funds so far. The argument that banks don’t have enough capital to lend does not ring through. The Capital Assistance Program (CAP) was designed to make sure that financial institutions are sound and have sufficient capital to support businesses and consumers. The results of a financial stress test on banks published in May, 2009, speak for themselves and even sparked a stock market rally on Wall Street that nobody thought would be possible just a couple of months ago. Treasury secretary Geithner also confirmed that the vast majority of U.S. banks have more capital than needed. Yet the evidence is indisputable. Lending to consumers and business while not at a halt remains strongly subdued and remarkably insufficient to support potential economic growth. Every day that passes makes it harder for the Obama administration to explain to the public why consumers and small businesses are being asked to be frugal and patient all the while Wall Street is celebrating. The mice are not dancing because the cat has left the house, they are celebrating because all cats have been stymied once and for all to never hurt them again ever. The public wants to know when Washington will stop working for Wall Street and start to work for the people again. When we think about the financial crisis on Wall Street and in the economy we try to figure out why it happened, who was responsible and how can we prevent it from happening again in the future. Today we still have a lot more questions than we have answers, but the sun is beginning to shine, and one issue is starting to emerge which probably for years and years has been tucked away from the public’s view. This crisis is pulling the blanket of secrecy from a bunch of Wall Street bankers smooching and spooning undercover with Washington’s big guys for the last several decades. Of course we would expect them to be somewhat embarrassed about busting their secret arrangements, maybe even flee the scene to break up their unholy unity for good. Much to our surprise none of this is actually happening. Mr. Dimon, chairman and head of JPMorgan Chase, has sought to ratchet up his business of influencing Washington in late 2007, when the financial crisis hit and the democrats together with the Obama administration were beginning to settle in. Jamie Dimon together with Goldman’s Loyed Blankfein are among a rare breed of executives who have not jeopardized their companies by taking unwise decisions. Both CEOs in the meantime have returned all funds received from Treasury’s capital assistance programs (CAP). These days JPMorgan’s chairman comes to town about twice a month and not twice a year as he used to. He met with Treasury secretary Geithner, White House economic advisor Lawrence Summers, and several lawmakers in recent months and gets a list from his staff to call a half-dozen public officials each week. He has made it a regular thing to nurse his precious Washington relations to make sure he is not kept out of the loop. When JPMorgan wanted to return its TARP funds his influential connections helped him to ease the terms for banks allowing them to repay the money. In the end Washington caved in to Dimon’s complaints about limitations for hiring skilled foreigners and on executive pay. He also helped thwart attempts to lower the principal on mortgage payments which would have benefited homeowners. Another contentious issue is Mr. Dimon’s objection to regulate the market for credit derivatives by keeping part of it independent from regulated clearing operations. Fees from underwriting over-the-counter credit derivatives are a major source of income for JPMorgan Chase. 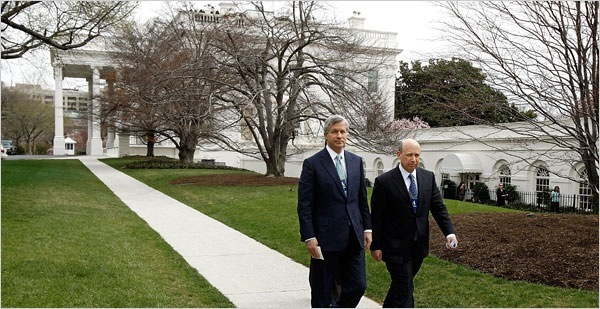 Mr. Dimon’s connections to Washington date back to his day at Citigroup when he offered Mr. Rahm Emanuel, then senior advisor to president Bill Clinton, a job at the firm. Today Mr. Emanuel serves in the Obama administration as White House Chief of Staff. William Daley, former commerce secretary and influential Chicago lobbyist, is also currently on JPMorgan’s payroll. Mr. Dimon mindfully replaced some of his staff with wired democrats to better serve his Washington agenda. Most surprising is his connection to Treasury secretary Geithner. Mr. Dimon holds a seat on the board of the New York Federal Reserve. Mr. Geithner served as president of the NY Fed till he joined the Obama administration in January of this year. How can a CEO of a public company sit on the board of a federal regulator? That’s like John Gotti being a member of the U.S. Department of Justice. For the first time this Monday JPMorgan Chase held a meeting of the firm’s board in the nation’s capital. Messrs. Geithner and Emanuel were both invited, but only the chief of staff first agreed to later withdraw not to appear too cozy with Wall Street bankers. This invitation is nonetheless testament to the arrogance of invincibility that has shrouded executives of our most powerful corporations. In Washington nothing gets done without support from Wall Street and Wall Street knows it. Wallshington is more important and influential than the oil industry, the industrial complex or even the powerful military. This has never been so true like it is today with a handful of firms left unfettered from the crisis and government’s control. Their power is more concentrated in the hands of a few and therefore even more difficult to control. Executives on Wall Street get whatever they wish from every administration or congress there is. This too big to fail monster is sucking the lifeblood of morality, decency and sustainability out of a societal fabric that once was the envy of the rest of the world. In the latest report for the period ending July 17, 2009, the Treasury department listed employed funds under the Troubled Asset Relieve Program (TARP). The financial industry received $204.2 billion, $70.2 billion have been returned, leaving the industry with a total of $134 billion outstanding. In the automotive industry $77.8 billion from 79.9 are still owed to the taxpayer. Automotive suppliers received a more humble $3.5 billion. Targeted investments in Citygroup and Bank of America totaled $40 billion and asset guarantee programs for Citigroup another $5 billion. The Troubled Asset Loan facility (TALF) committed $20 billion. Rescuing troubled insurer AIG required another $69.8 billion. To this day the financial and the automotive industry owe the taxpayer $350 billion, yet government has devoted only $18.7 billion in home affordable modification programs to avoid foreclosures. While taxpayers were required to fund the bailout of Wall Street with 350 billion dollars the financial industry is reluctant to modify loans and scores of families are still forced out of their homes. This current administration with the most eloquent president since years will have a hard time to sell this to the general public. Wall Street firms reverting to old habits by once again doling out mega bonuses to their club members will not make it any easer.